Let me start off by saying that I really like everything about this gallery. To borrow an old soccer adage, this is where I broke my duck, so to speak. 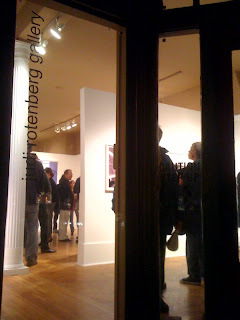 As the first Newbury St. gallery I ever visited, I instantly felt comfortable walking up the curved stairs to the entrance. I have always enjoyed the openings and showings here and have only been made to feel welcome. Last night was an excellent opening for art admirers of all levels. I thought that Rebecca's exhibition was easy to take in and enjoy at my own pace. I made my laps around the two rooms, eaves dropping at times, on some of the numerous conversations going on around me. It was louder than other openings I had been to, despite the crowd being much smaller, but it was a good noise lacking the pretension you might expect at a show of this quality. There was lively discussion and laughter giving off a friendly feeling to this show as soon as you walked in. The crowd ranged in age, and style, but it all seemed to blend together nicely. I was able to have a nice conversation with a gallery intern. She was very happy working here, and it showed in her demeanor. Despite the buzz going on all around and the many requests for wine, she made time to talk with me about this and that. She was genuinely interested in me as a visitor and what I had to say about the works on display, regardless of my lack of artistic knowledge. I highly recommend visiting this space whenever you get the chance - I often just pop in on my lunch break, poke around, and leave. This may be one of the least intimidating spaces you will find in the area.